The Acme ® Thunderer Brass Whistle is a nickel plated brass, non stick pea whistle with tapered mouthpiece to produce high pitch. Ideal for coaching, Police, and Teachers. Size 4.5(l) x 2.0(w) x 1.6(h) cm. Always buy from Newitts as good quality product, quick delivery and easy to use online purchasing. Excellent whistle and well made. Precise, powerful, easy to clean and virtually eternal-I have been using them since I begun refereeing, more than 20 years ago. 5 out of 5 Classic! Delivered next day. Just what I wanted Super quality item at a very reasonable price?? 5 out of 5 Great Buy! These whistles are the best on the market. As a teacher I have been using one for the past twenty years and during that time have been regularly purchasing similar Acme whistles to give as gifts to those completing their teacher training or completing their probationary year. I highly recommend this product - and have found this supplier to currently give the best price around. A classic whisle, with wonderful sound & feel. Price, appearance & delivery are excellent. I trained as a football referee with the London FA, who gave me a whistle as part of the (£165) course fee. It was crap. Players moaned about not being able to hear it. I bought this one from Newitts and it's been terrific. Instantly audible and really effective. Now the players moan about other things! 5 out of 5 Send him off ref! Bought this for my 4 year old grandson who became interested in the referees whilst watching the world cup, he was fascinated when they blew their whistles. I am happy to report that the whistle is first class with an "authentic whistle sound" and it is also quite loud, and he loves it. His mum and dad are not quite as keen. Bought this Acme Thunderer Brass whistle to replace a lost one. As good as the old one. Price and delivery very good. A great whistle if you haven't got much puff! Service was quick and efficient and I would recommend this to all teachers! The whistle is brilliant, so much better than the cheap ebay one I originally bought. Very easy to blow and gives a consistent tone. It feels very well made, no sharp edges. Needed a new whistle to continue my rugby refereeing. This has been fantastic. Well worth the money. Would highly recommend. 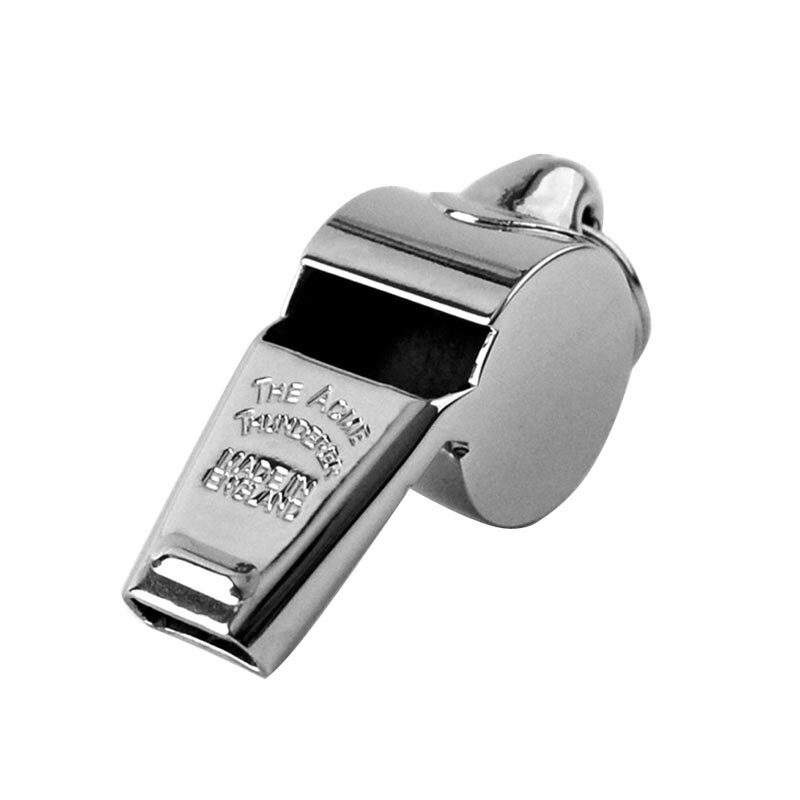 An excellent whistle for any Referee/Umpire to use on match days, it is easy to blow, loud and efficient - I would recommend the Acme Thunderer to all Referees, probably the best whistle on the market. Best whistle you can buy for refereeing. Loud and requires little effort. Same whistle as used by the six nations referees. My very first, and only, whistle bought when I started teaching was an Acme Thunderer so when I had need to buy whistles for a friend, it was only natural that I look for the same make. I also wanted to buy locally and was delighted when I saw that Newitts stocked these whistles. I was a bit surprised when they arrived to find that my Acme Thunderer had shrunk to half its size but I needn't have worried. It is described as a referee's whistle on Newitt's website and it therefore needs to be heard. Mini or not, this whistle will do its job but I do worry a bit how big, butch referees are going to hold it in their big hands! Louder and more resonant then other whistles I've owned, great for coaching and refereeing rugby, allows you to control the volume surprisingly well.